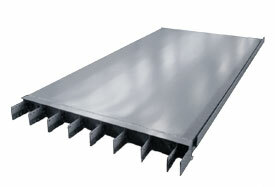 We designed sandwich structure vehicle floor elements for KONE Plc to their specifications. KONE needed a weight-optimised and easily transportable solution for the vehicle elevator´s 18 m2 floor. The floor is made up of four 3 m x 1,5 m sandwich elements. A 1000 kg weight saving was achieved compared to a conventional structure; the payload of the elevator was thus increased from 4 tonnes to 5 tonnes, a 25 % payload increase! The weight saving also allowed the use of a lighter counter weight. The elevators are assembled in the lift shaft and the assembly was made easier thanks to the lighter elements.